Were we treated to a great game on Thursday night or what? My game day story, called for the prescription to victory going through the defense. Little did I know, I’d be spot on with calling on them for their best defensive performance of the season and the Boys delivered, big time. The story headline was asking could we repeat the thunder from the 2009 contest against the Saints? In breaking down the Saints, I saw that their game went thru the two backs and at the very least those two needed to be contained. For two guys getting roughly 28 touches a game and a unit that averaged 37 points a game, it promised to be a real challenge. But in my many years watching, working or coaching football, I’d seen and taught that a great defense can stop any offense! “No “D”, No Rings” has been my rallying cry for over 50 years. If this defense can play like this the remainder of the season, they can do very well. The guys on the other side of the ball are still a concern to what can be done the rest of the season. A defense this well can win any game, anywhere, anytime. Don’t believe me look up Trent Dilfer or Jim McMahon as QB winners. Neither was very good, nor did they have with the defenses that those teams had. 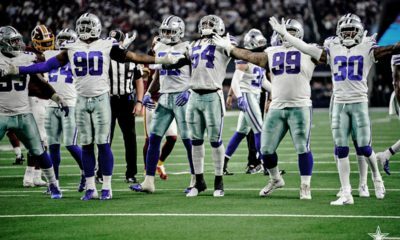 Thursday nights game was the Cowboys coming out party for this team, but most of all this DEFENSE! This unit has played some really great football this season and this game was really on a whole nother level. This Saints team had all the analysts praising them for their 37 ppg average, over 400 yards in total offense per game and their running backs posting 20 TD’s in just 11 games. They came out victorious in their shootout with the Rams, which gave them a leg up on top seed in the NFC. That put the Saints in a position to give it everything they had in this game. It wasn’t a game they were taking lightly and certainly the Boys weren’t either. 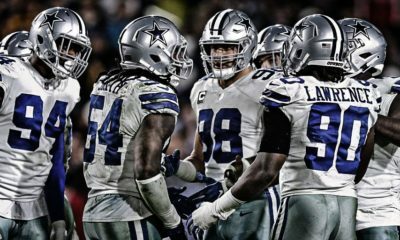 The Cowboys defense dominated from the first defensive series. I believe that Saints drive lasted 39 seconds! Their second possession wasn’t any better. I was thinking & hoping for a really good effort limiting them to FG’s instead of TD’s, but what we got was off the charts. The “D” limited them to ZERO points in the first half, with just 59 total yards, 39 thru the air by Drew Brees. For the entire game New Orleans was limited to 47 plays from scrimmage and 192 total yards. For a team that averages over 400 yards a game, that’s like pitching a 3 hitter in baseball. Let’s be real for a minute, we were hoping for a really good defensive performance and getting awesome, was a Christmas gift come early and not a minute too late. To be honest, I’ve not been a big fan of Tyrone Crawford thru the years. True team player, playing wherever and whenever the coaches need and preforming well enough. His production over the years has been underwhelming to me and the contract hurts his assessment by myself and many others. In this game, he was at his very best, always in the mix, applying pressure and stuffing the middle. None bigger than the 4th & 2 play that was an incredible possession that was slammed inside the Dallas red zone. One of Baldy’s clips below, watch him stand the play up! Even his fumble recovery, that was negated by a defensive penalty, was with great technique and knowing he didn’t need to be a hero. 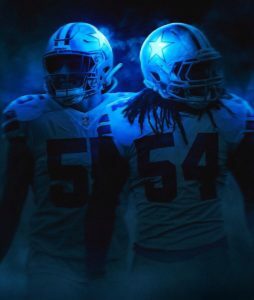 We’re witnessing the growth of two terrific, young linebackers, in Jaylon Smith and Leighton Vanderesche (LVE)! We all were confident that Jaylon would be this good, but LVE was a bit of a roll of the dice in the eyes of many as he was only a starter for one year at Boise State. I saw some tape on him and felt he’d be a nice player in his first year. Had to love his size and speed. Tape showed he was really good sideline to sideline and his coverage skills allow him to be a three down backer. But I thought it would take a year for him to adapt to the level of play, understanding the speed and scheme in general. 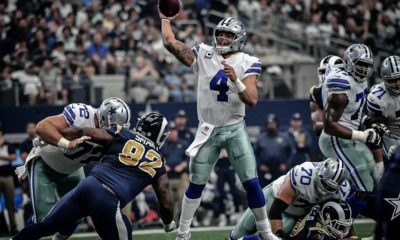 What we’re being “treated” to just the beginning of a very special career in Dallas. As the season moves along, these two young playmakers are energizing the whole unit. When I first looked at the stat sheet they each had “only” 6 solo tackles and another 3 & 4 assists, which seemed way too low, as it appeared they were everywhere. Then I realized that New Orleans didn’t have the normal 60-70 snaps per game, thus limiting their individual snaps & tackles. When they were on the field they made their presence felt. On Thursday night, these two were squaring up and planting Saints players. We witnessed Alvin Kamara getting up after one of Jaylon’s smackdowns and he was groggy, but appeared alright. He got up wanting to know the number of the train that just hit him. 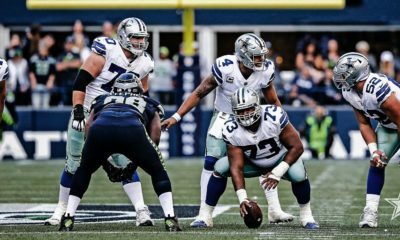 Here’s the first of a handful of short play breakdowns by former Cowboy lineman, Brian Baldinger. Most will focus on the defensive side of the action. Watch my Petcat from 2017’s draft squad, Xavier Woods, gone on a seek and destroy mission. 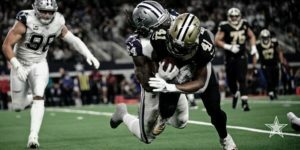 The play was ruled an incomplete pass, but due to the potential recovery by Michael Thomas, Peyton challenged the call, which gave the Saints the ball inside the Dallas 10 but used up the last of the Saints challenges. Ultimately, this prevented them from challenging the first down by Beaseley in the 4th period when his knee was clearly down about two yards short of the first down. This next clip is just two plays later on the same drive by the Saints. Baldy points out the coverage work to take away two of the targets before the outlet to Kamara. While watching live we are momentarily frustrated that Byron Jones was unable to make the tackle. But in watching this tape, you realize that without that slight delay that Jones caused, then Kamara may well have scored. The result was the touchdown saving tackle by Jaylon Smith on 3rd down. Realize the ground he covered to get to the ball carrier. Here’s the Dynamic Duo giving Kamara & Peyton another headache. Their lateral pursuit speed is special. The nail in the coffin was the pick off the carpet by Jourdan Lewis late in the 4th. Enjoy the Boys excitement in delivering this play and the victory. This is another clip of our newest star player in Dallas, Amari Cooper. He does do great work beating M2M coverage on a consistent basis. A big part of the success offensively was converting 3rd downs in this game. Here are a few of those and one of them is the run by Dak, needing 10 or 11 yards and getting them by twisting, cutting & showing power in going through a handful of Saints players. Final clip, final Saints play, is the one where Lewis got the pick. That’s what gets the hype and well deserved, but its the work in the trenches that often goes unnoticed. Baldy, gets jacked up with the spinorama’s by the two tackles, Collins & Crawford. What I want to point out is the pressure applied by Maliek which forced Brees to let it go, a tick early and the end result enabled Dallas to run out the clock.